For coverage I prefer a medium to full finish because I don’t have perfect skin, although it’s improved significantly over the past year. For finish I tend to prefer something luminous but not too glowy as mattes tend to make my face look flat. On skin type, I am approaching my mid-30’s so anti-aging is something I am concerned with, but I prefer to look for anti-aging ingredients in skincare. Aside from aging concerns, my skin is combination and sensitive. I have a roundup of some foundations that I have in rotation right now along with thoughts on each one I’ve tested by coverage type. I would say all of these have a natural to luminous finish. Hands down, my current favorite formulas are from NARS. The All Day Luminous Weightless Foundation offers medium to full coverage with 2-3 pumps. It’s very concentrated so a little goes a long way and you need to shake the bottle before pumping out any product. I’ve found application works best by blending with fingers or a damp beauty blender. Having a good base for this is key. I really like the Dolce & Gabbana Primer or the NARS Pro Prime Radiance Enhancing Primers right now. For color I am closer to a NARS Punjab, but I tend to tan and lighten easily so I picked up Santa Fe to mix in for days when I feel slightly lighter. The Pure Radiant Tinted Moisturizer in Groenland has been a long-time staple for me. I have Alaska to show below for comparisons, but my go-to shade for a long time has been Groenland. I like this because it’s not as rich as a traditional tinted moisturizer but has more of a lightweight foundation feel. It glides on the skin and covers in the most natural way melting into the skin. It gives the skin a radiant glow without looking too dewy or shiny. There is no shimmer in it but it still gives the face a luminous look while offering an impressive amount of natural coverage. I like this set with the NARS Light Reflecting Loose Powder or Hourglass Diffused Light. Tom Ford Traceless Perfecting Foundation is my second favorite for a medium to full coverage foundation right now. It covers really well, lasts all day and photographs nicely without giving your face a white cast. Being that it gives a fuller coverage compared to other formulas, it isn’t as fluid or liquid as other formulas and feels slightly thick, but it doesn’t feel heavy on the face. It lasts all day long without many touch ups required and holds up in warmer weather nicely. It is on the pricey side but I’ve had nothing but good experiences with this one. Next up is Laura Mercier. The Tinted Moisturizer is a classic cult-favorite in her line but I have a love/hate relationship with this one. There have been shade extensions and although the formula is sheer and very forgiving, I feel that there are only certain times during the year when I can wear this. Spring to summer is one when I have more color and have a better color match to Sand. Due to the sheer coverage I find this is good only on the good-skin days. If you’re one who only needs a light base and something to even out the skin naturally, this is a really good one. 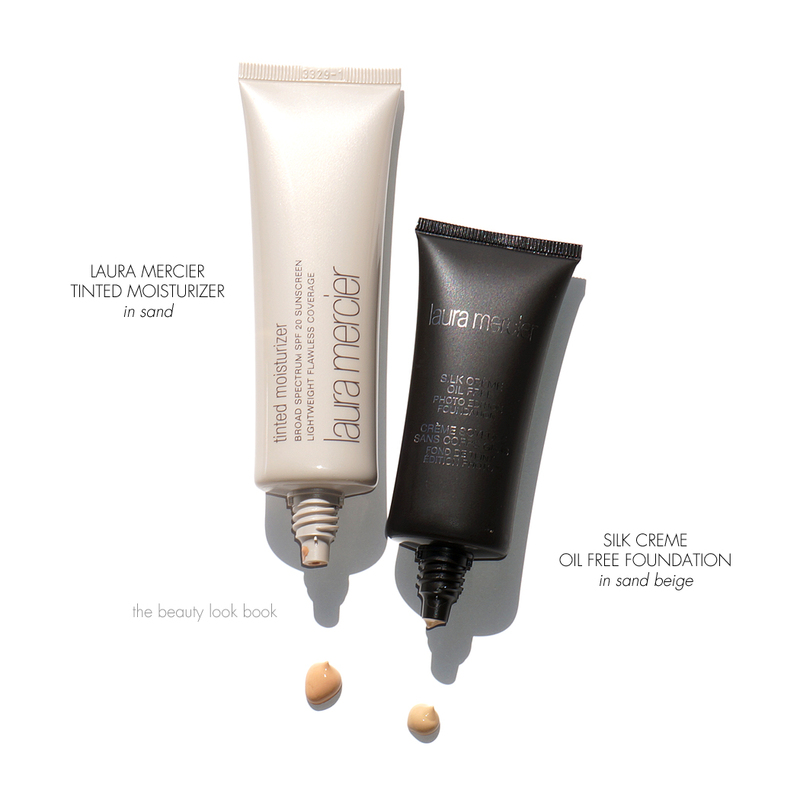 The latest from Laura Mercier is her Silk Creme reformulations in the Oil Free and Moisturizing formulas. I tried the Oil Free at the counter since I just used up the Flawless Fluide in Honey (which a lot thinner in texture and quite fluid). For the Silk Creme, I am in between shades but the nice thing about the Silk Creme Oil Free is that it adjusts and warms up on the skin without oxidizing. These new formulas are designed to be “Photo Ready” that have a natural matte finish that is long-wearing. I found the Oil Free to be full coverage on my skin. It’s ultra concentrated and a bit on the thick side but a tiny bit goes a very long way and you don’t need a lot. I didn’t quite see a matte finish, on me it looked a bit dewy but it did last a remarkably long time (with powder to set of course) without budging or fading. The texture does feel a bit heavier than others so you will need to experiment with application. I decided on Sand Beige for now (it has a lot of olive), although I will probably need Cashew Beige (more golden) in the summer. Chanel has some new shades of the CC Cream out this season (finally!). The formula originally came in two of the lighter colors in the US. This spring/summer they’ve added 30 Beige and 40 Beige. The color selection is still extremely limited so I am thrilled I was able to find a match to the 30 Beige. The Chanel CC Cream is something that offers medium but buildable coverage and contains SPF 50. It is on the semi-thick side like many CC Creams but it’s still has a lightweight feel. It’s very hydrating but not too moisturizing which is perfect for my normal/combination skin. If you have normal to dry skin and found that the NARS foundations weren’t moisturizing enough, I highly recommend you try the Chanel CC Creams – it offers a fresh glow with medium natural coverage that makes the complexion look healthy. I’ve swatched all three shade options below and compared it to other Chanel formulas as well. Another favorite for me this time of year is the Chanel Les Beiges All-In-One Healthy Glow Fluid. This one has been listed as limited-edition since it launched last year so I’m surprised it is still available. This is a glow fluid tinted foundation that has a tinted moisturizer feel. It comes with SPF 15 and has a more lightweight texture compared to the CC Cream. It’s also sheerer in finish making it more forgiving in terms of color match, but they are all on the pinkish side. I am a 20 Beige right now, but I also own the 30 Beige and mix the two occasionally depending on my skin tone. Below are swatches of all the Les Beiges foundations (they skipped shade 50 for some reason). Also included are the Chanel Perfection Lumiere Velvet foundations I’ve used in 20 Beige and 30 Beige. When it comes to base makeup, I’m not particularly adventurous in trying new brands. I usually stick to the ones I like and look for new releases because of formulas, color selection and texture. I have a lot of olive and yellow in my skin so many foundations turn pinkish on me. MAC and Bobbi Brown have really good color selections but I can’t wear the formulas (they irritate my skin with tiny red bumps). Armani has really good formulas but these days they often have a gap in color options and usually are missing my shade. If you’re in search of a new foundation I hope you found this roundup helpful. 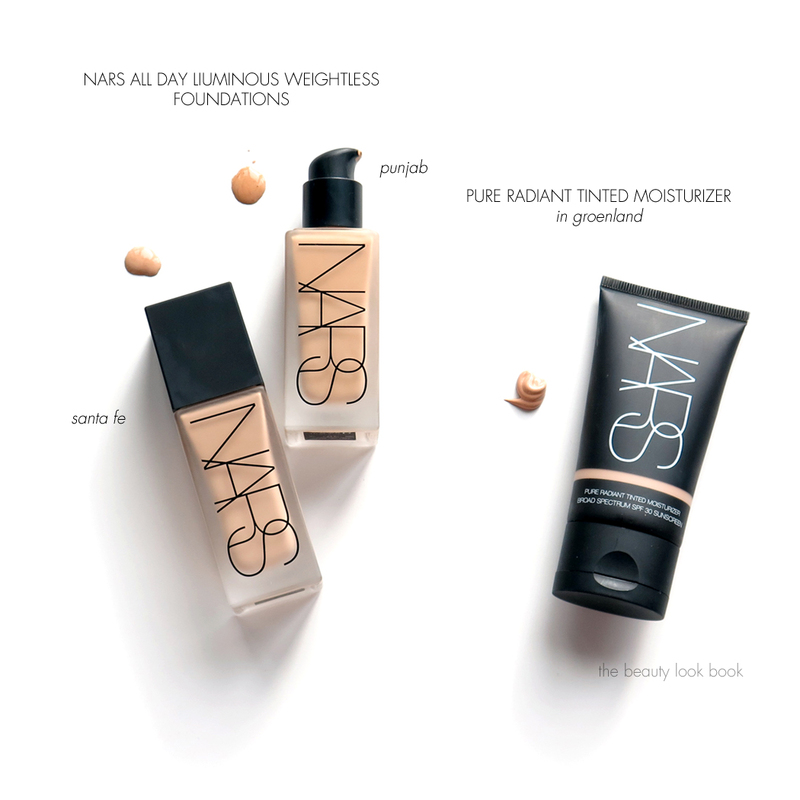 Out of all the formulas my top three picks are the NARS All Day Weightless Luminous, NARS Pure Radiant Tinted Moisturizer and the Chanel CC Cream (because I’m a huge Chanel foundation fan). Do you have a favorite go-to foundation right now or do you switch things up this time of year? This post was sponsored by Nordstrom. As always all opinions my own. All items purchased by me. For more information, refer to my disclosures.